I just installed a new ssd (samsung 250gb - 850 evo) and new RAM (8gb). now for the problem... I installed snow leopard from the disc that came with the MAC, and then updated the software as much as i could (By searching for updates). Now, I wanted the get the most recent OS, sierra, but it turns out you have to upgrade to El capitan first... Anyway, i download the EL Capitan in the Appstore and procede. 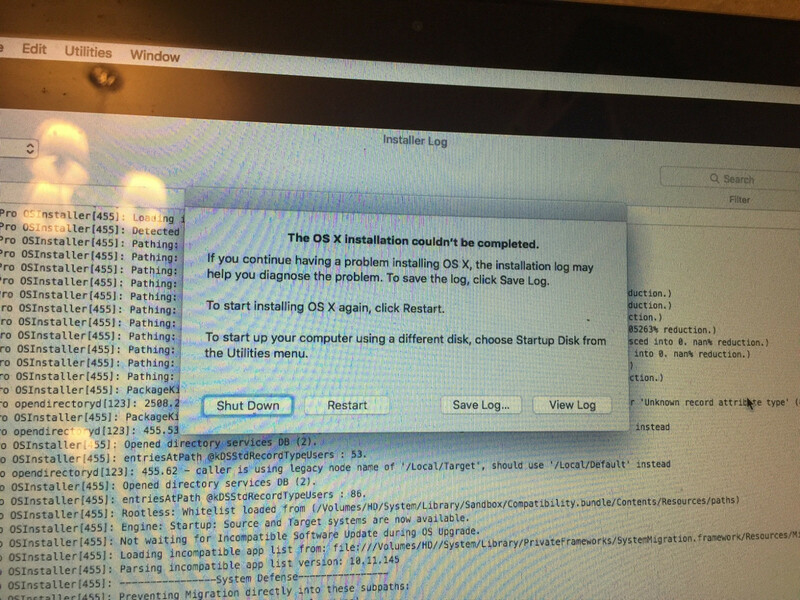 The installation seems fine, but in the end it said "Installation failed" and im left with the choice to reboot and try again. same result over and over. Am i missing something? I formated the new ssd to OS x journaled and choose the GUID partition table. The fact that this fails is indicative of an issue with the battery of your MacBook Pro. Second, reset your NVRAM by turning off your Mac, holding ⌥⌘PR and turning your Mac on again. Make sure to hold the buttons until you hear the startup chime for the second time. If you have followed all the steps and the crash still occurs during logBatteryState, you might want to get another battery of the same model that is confirmed to work, then install it in order to figure out whether there is an issue with your battery; if not, it might be an issue with the PMC on your logic board. I have managed to enter new OS by pushing Shift and thus booting into Safe mode. I've got asked several questions about my time zone, keyboard layout etc, and it ended with Login screen with newly created user. However, the next problem is that installer remained "sticky" somewhere. Every time I tried to boot in non-safe mode, installer was starting again. I have no idea where does it write, but I guessed that if I try to update system, that update will overrride installer in the boot options. Indeed, I've got different message after reboot: "Installing Software Update". And then after reboot I was finally in the new OS in normal mode. Not the answer you're looking for? 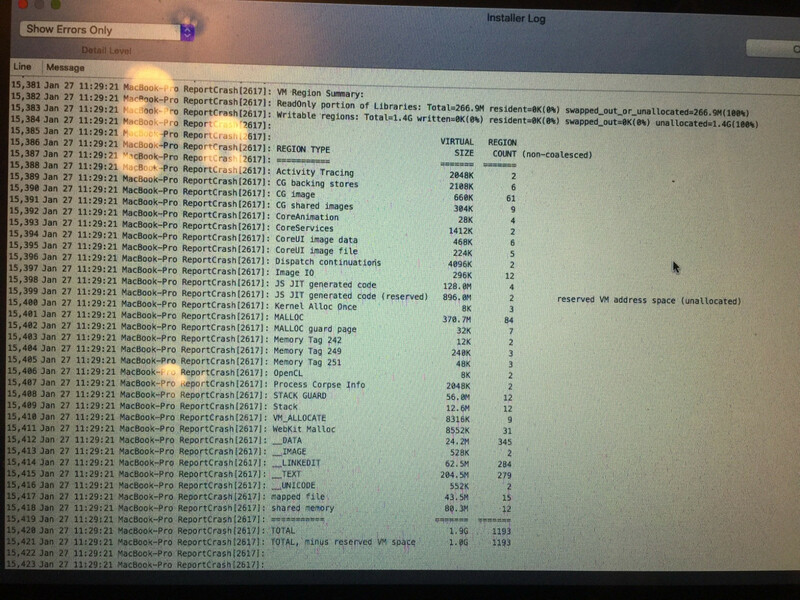 Browse other questions tagged macos macbook el-capitan snow-leopard install . How to move data from the cloned external drive to the newly installed ssd?